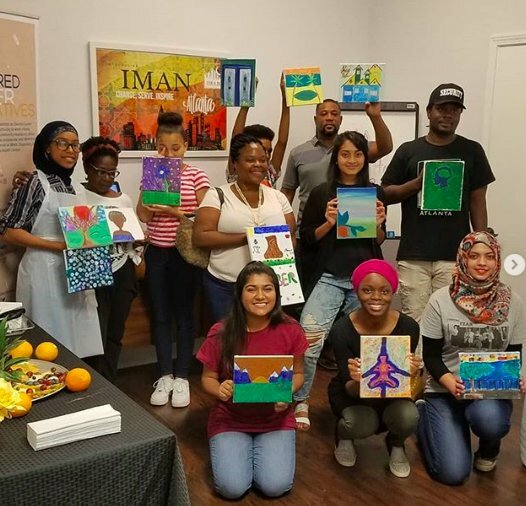 IMAN Roster Artist and Sacred Cypher Creative Kelly Crosby recently led a “Paint & Sip” session for the Atlanta community as part of the Grassroots Power Hour series. In the spring, Crosby completed an artist residency rooted in the concept of “waging beauty”, and this past month’s gathering successfully introduced attendees to ways the can use artistic expression as a personal and collective healing tool. Before starting to paint, community members reflected on and discussed the relationship between colors and emotions. Crosby encouraged guests to more intentionally choose their color palettes, and use that self-examining exercise to more authentically and safely access their feelings. 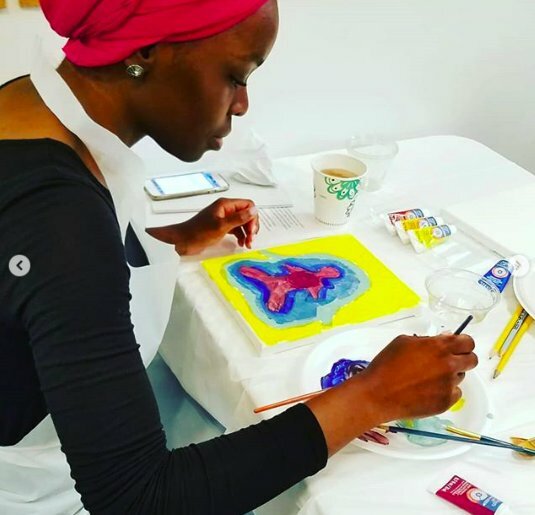 The painting activity was themed “Envisioning Your Safe Haven” and, as strokes of blue, red, purple, yellow, and green blended across the canvases, each artist imagined, created, or recreated their ideal safe space. Jayida Ché Herbal Tea Spot co-founder Aleathia Saleem helped the attendees tap further into their creative energies, serving several flavors of her carefully crafted tea. From the “Pure Peace” blend to “You Had Me At Rose”, each cup was filled with Jayida Ché’s signature mixture of tea leaves, roots, and flowers. Saleem stressed to the community members the nutritional benefits and soothing effects of ingredients like chamomile, lavender, ginseng, hibiscus, rose, and lemon balm. With a canvas in one hand and a cup in the other, each community member then shared the reflections on their safe haven. Many had created vibrant images of nature landscapes and peaceful homes, but one Green ReEntry cohort member presented his version of the iconic ‘Thinking Man’ figure in a bold contrast of forest green and cobalt blue. “My safe space is not external, it is internal. My mind is my safe space,” he explained. IMAN Atlanta thanks Kelly Crosby, Aleathia Saleem and all our Grassroots Power Hour attendees for bringing holistic healing to the community. Stay tuned for exciting updates on all the Fall events in Atlanta by following IMAN Atlanta on Facebook. This entry was posted in Arts & Culture, Organizing & Advocacy by IMAN Staff. Bookmark the permalink.